People in Scotland are drinking less alcohol, according to an NHS report analysing retail sales. 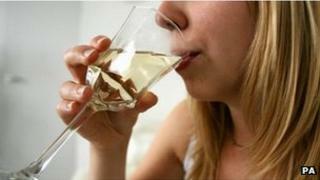 The amount of pure alcohol sold north of the border fell by 4% between 2010 and 2011, it said. However, alcohol sales remained 10% higher than in 1994 and 20% more alcohol is sold per adult in Scotland than in England and Wales. The downward trend in retail sales was visible across all drinks categories, with the exception of cider. The report said the most recent data suggested that per adult sales of pure alcohol in Scotland fell by 4% between 2010 and 2011, from 11.7 litres to 11.2 litres annually. The figure for England and Wales was 9.3 litres in 2011. The Scottish alcohol intake represents an average of 21.6 units per adult per week. The government recommends women should drink no more than a maximum of 14 units a week, while men should drink no more than 21 units. The report said that on-trade sales of alcohol in Scotland - that sold in pubs and restaurants - had fallen by 30% between 1994 and 2011, from five litres to 3.5 litres per person. However, off-trade sales in shops and supermarkets had increased by 48% over the same time period - from 5.2 litres in 1994 to 7.7 litres in 2011. It is estimated that about two-thirds of all pure alcohol sold in Scotland in 2011 was sold through the off-trade. In May, MSPs passed legislation which will make Scotland the first place in the UK to introduce minimum drink pricing. The SNP government will set the price of alcohol at 50p per unit. And in October last year a new law came into force in Scotland which meant shops and supermarkets could no longer make offers such as buy-one-get-one-free and multi-buy discounts on alcohol. Health Secretary Nicola Sturgeon said when the legislation was introduced that the ban on bulk-buy deals would cut alcohol consumption. Reacting to the latest report on the issue, Ms Sturgeon said: "I welcome the drop in sales of alcohol in 2011, however, sales are still at an unacceptably high level and are still around a fifth higher than in England and Wales. "These findings demonstrate the continuing extent of Scotland's alcohol misuse problem, with enough alcohol being sold for every adult to exceed weekly recommended limits for men (21 units) each and every week since at least 2000. "In particular, sales in the off-trade have increased significantly since the mid-1990s, driven by very cheap alcohol prices, particularly in supermarkets. "A minimum price per unit of alcohol will almost exclusively impact on the off-trade and will raise the price of this cheaper alcohol." However, she added that no single measure would help change Scotland's relationship with alcohol misuse, and said the Scottish government had outlined more than 40 measures in its Alcohol Framework to try to tackle the problem. Jackson Carlaw, the health spokesman for the Scottish Conservatives, said: "We are cautiously optimistic that minimum unit pricing, as a public health measure, will help save lives across Scotland. "The reason the Scottish Conservatives secured the sunset clause was to ensure that, if this proves not to be the case, the legislation can be dropped. "Scotland's relationship with alcohol has to change, and while these figures show a decrease, the overall rate remains far too high."